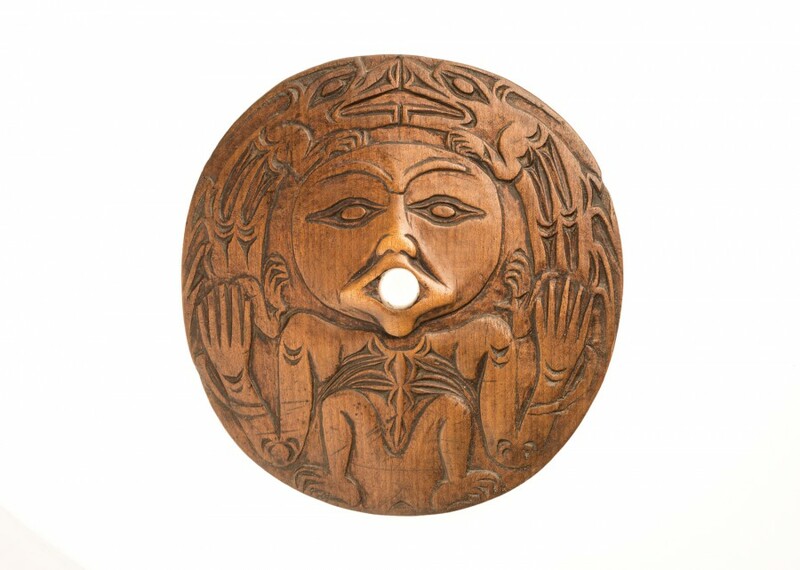 Like many Coast Salish spindle whorls, this carved maple example from the Cowichan area on Vancouver Island is simultaneously functional and spiritual. Whorls are used in spinning yarn to control the speed of the turning spindle. The imagery on Coast Salish whorls is said to allude to the spirit powers of the weaver. Here a human face, with the mouth as the hole for the spindle, is in the centre of the design. The body of the figure occupies the lower half; two animals, their mouths touching, are at the top. They might represent a supernatural fisher or mink, called sxwemecen in the Hul’q'umi’num’ language. The whorl was purchased by Charles F. Newcombe in 1912. This object selected by Dr Martha Black.